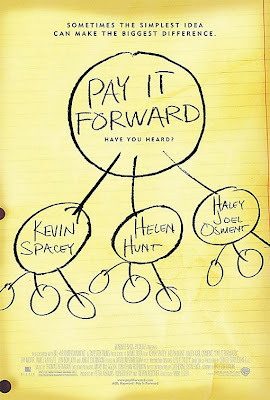 Have you ever had the chance to see the movie Pay it Forward starring Haley Joel Osment, Helen Hunt, and Kevin Spacey? It very impactful, heart-wrenching movie based on the principle that the actions of one person can start a chain event that can change the world. 1. I will make a handmade gift for the first 3 people to comment. 2. I have 365 days in which to send you the gift. 4. 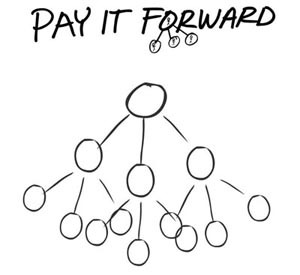 You keep this going by posting Pay It Forward on your blog (obviously, you must have an active blog to participate). To participate, just let me know when you plan to post the Pay it Forward on your blog. Glad to see you’re taking part in this adventure! Have fun! How brilliant! I plan on posting this on my blog for sure. Good thing the “stipulation” is 365 days as my wedding is keep me pretty pre-occupied. this is a fun experiment.